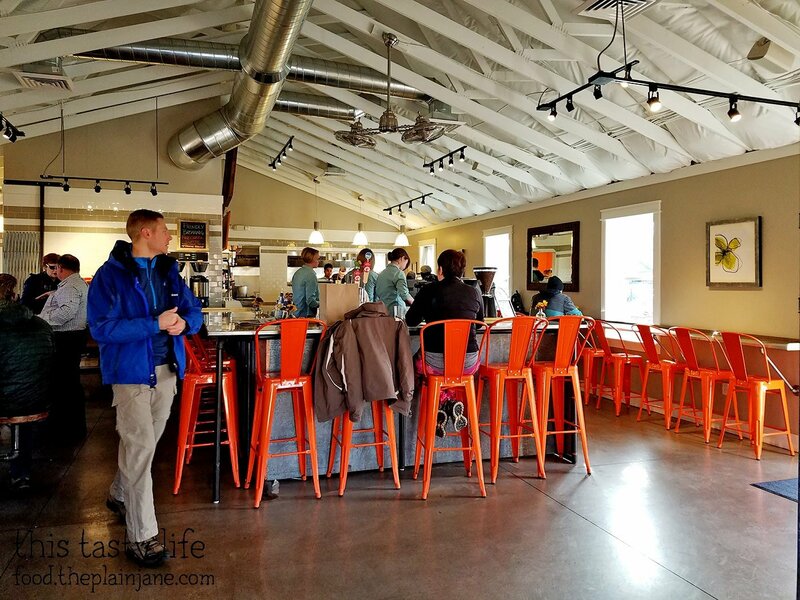 On our first full day in Flagstaff, we visited a place for breakfast called Tourist Home. Let me just say right off the bat that I liked Tourist Home so much that we went there TWICE. It is very unusual for me to want to go someplace twice since I love trying new places. But you shall see why I wanted to go again! How cute is this place? Tourist Home looks like a house from the outside. 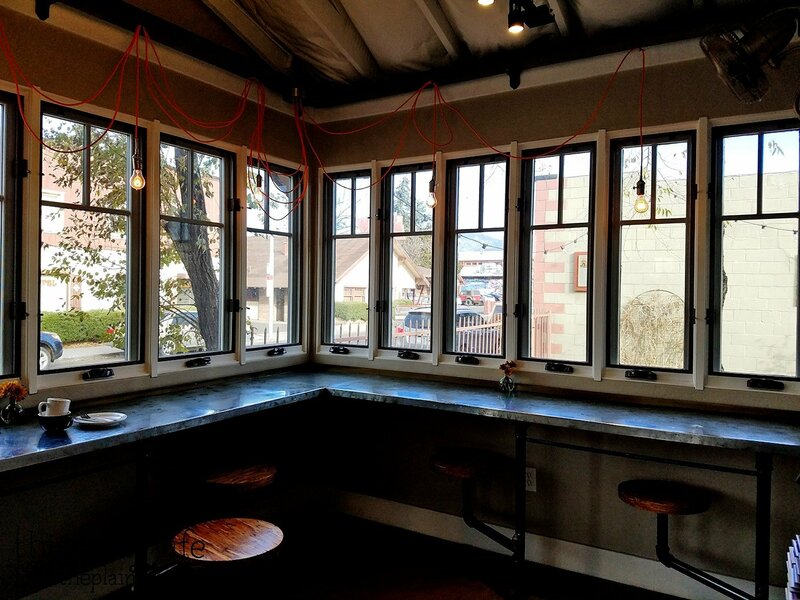 There’s outdoor seating, too, so you know it’s dog friendly. We ALMOST brought Maya with us on this trip, but I didn’t want to eat outdoors or leave her in the hotel. It was too cold to be outside for a long period of time! San Diegans aren’t used to 30-40 degree weather. That first day we went to Tourist Home just happened to be DONUT DAY. YESSSssssss! The interior of Tourist Home. Over on the left (where you can’t see) there are a few shelves with various kitchen goods (like sauces and such). This is the front “porch” area of Tourist Home. We parked it here for both visits. I liked looking outside while we enjoyed our breakfast. 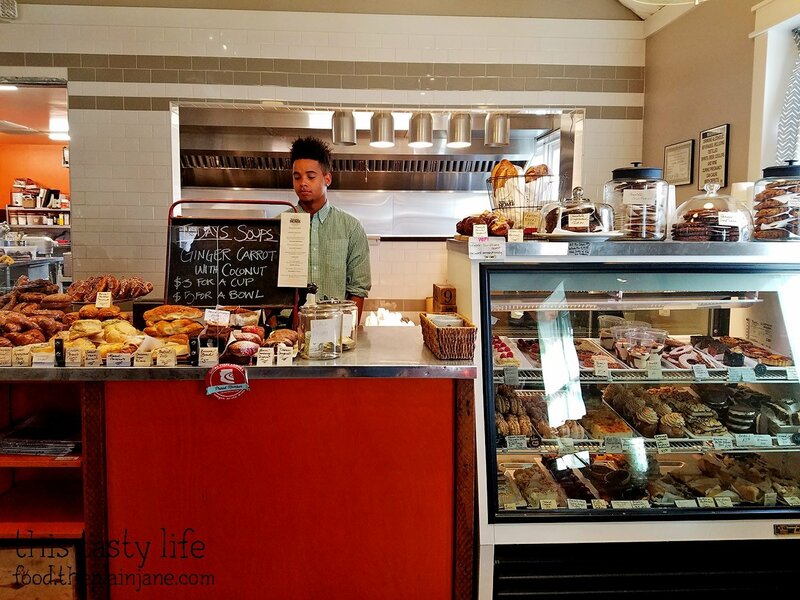 In the back was the order counter and more importantly, the bakery counter. OH BABY. 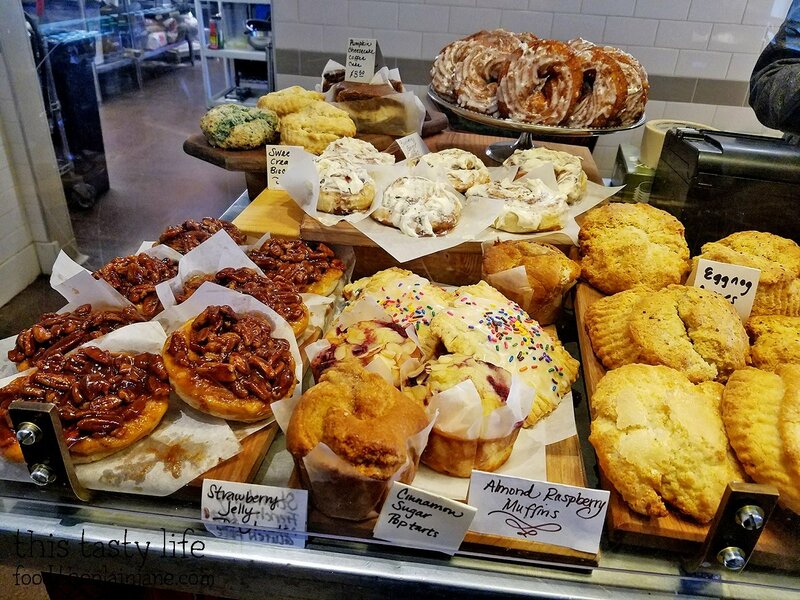 They don’t just have baked goods, either. 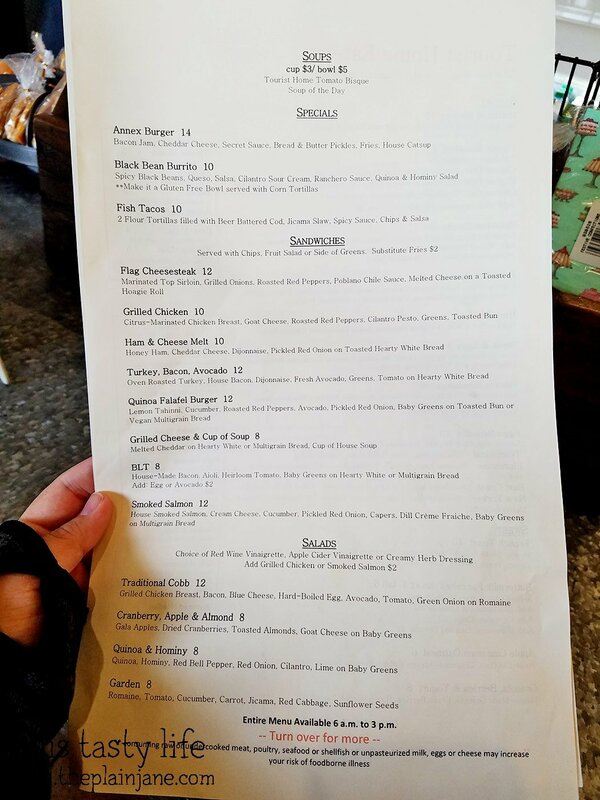 They’ve got a full menu! Here’s the lunch side. And here’s the breakfast side. Here’s what was in the case on our first visit. My eyes were bugging out! There were so many delicious looking items. I wish I could have tried it all. And here’s what was on the counter that first day. 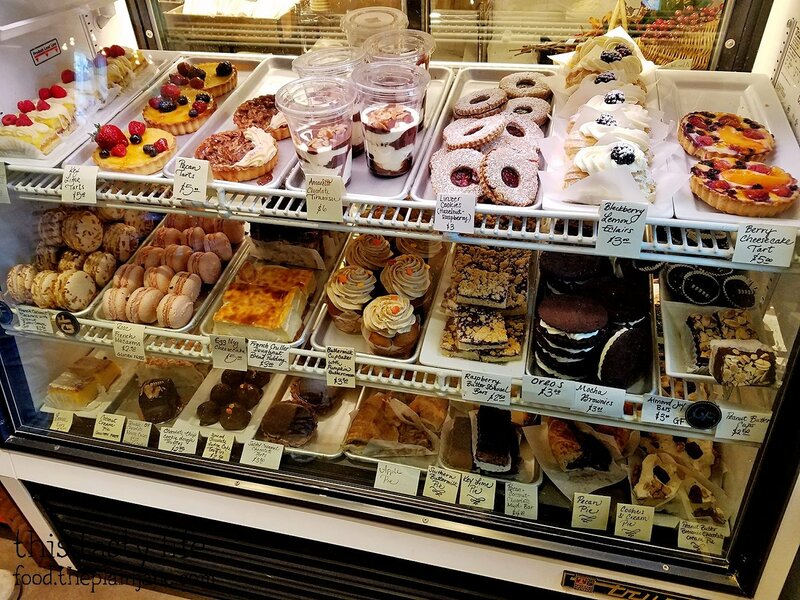 Just to the left of that… all of the DONUTS. Glorious looking donuts! 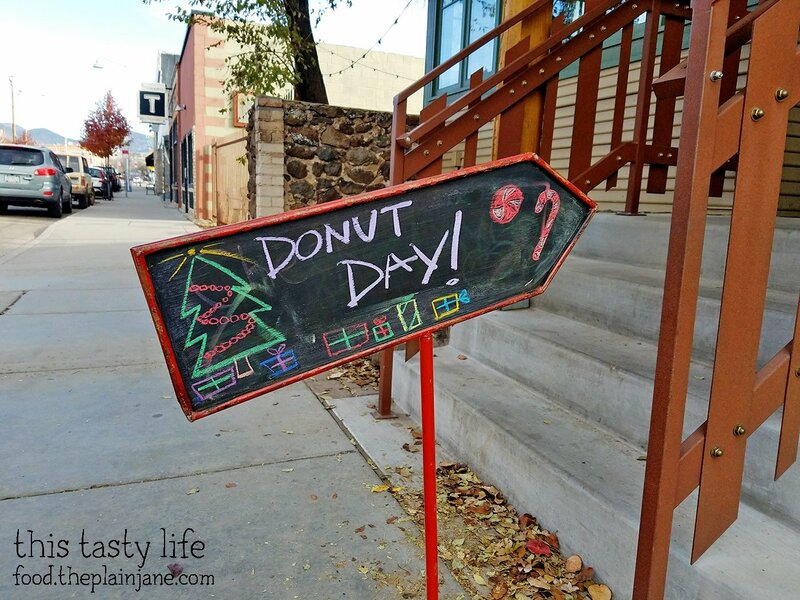 They also had TWO kinds of french crullers that day – pumpkin spice and regular. 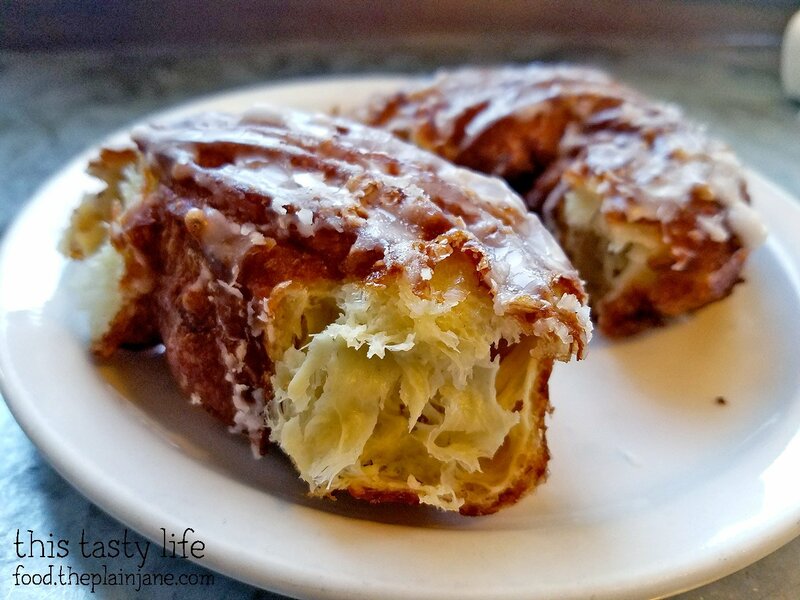 If you know me, the french crullers were my reason for being here! It was Donut Day after all… so here are more donuts! Here’s the case again from our second visit. Mostly the same – a few items were swapped out. Less donuts this visit – it was no longer Donut Day. 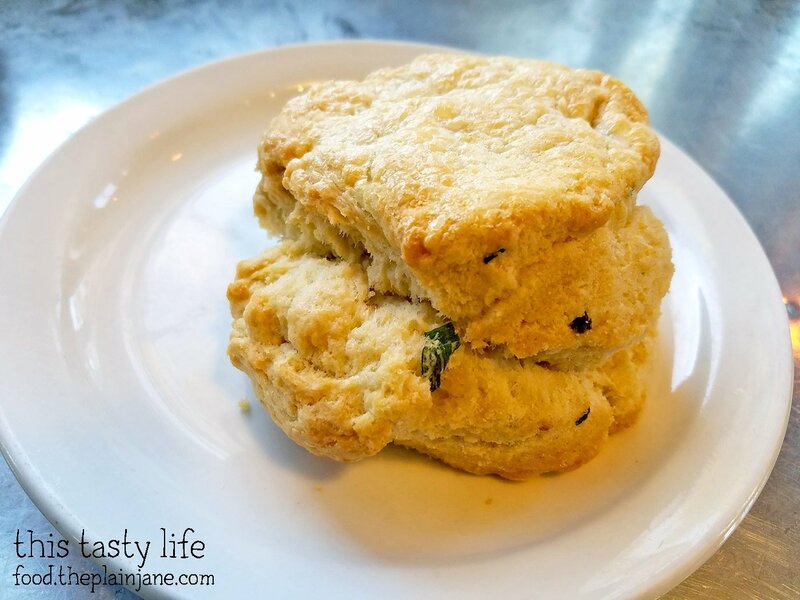 I spied eggnog scones which sounded really interesting! Quite frankly I’m surprised I didn’t get that pecan bun, either. Regrets! 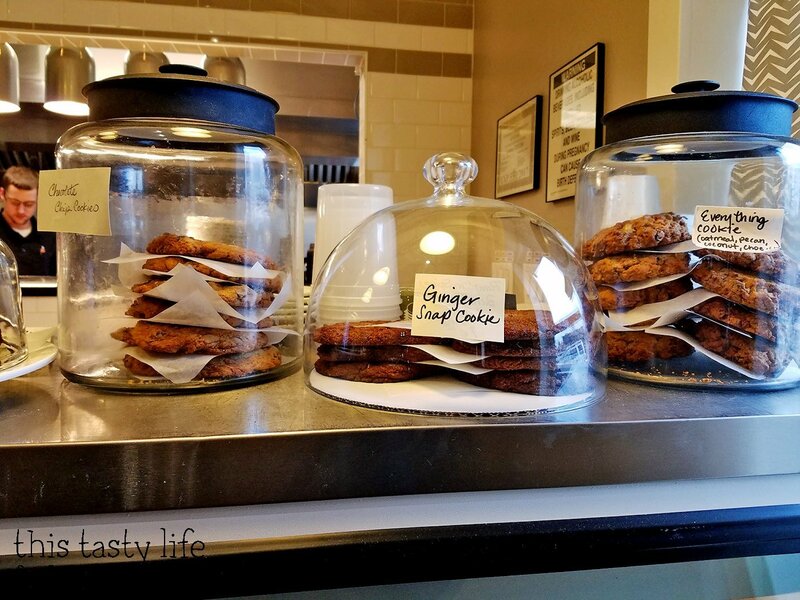 They also have cookie offerings for the cookie monster inside of you. One of the first items I picked up was this Scallion Biscuit. I adore scallions and I loved that you could actually see bits of scallion in the dough. The outside of the biscuit had a nice crunchy exterior while the inside had fluffy bits. It was buttery and had plenty of lovely scallion flavor. I loved it! 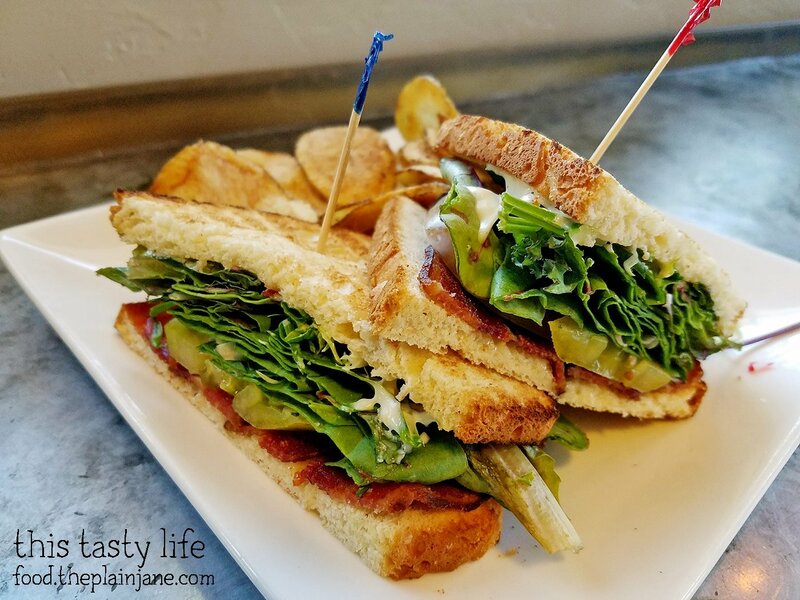 When I was doing restaurant research for our trip to Flagstaff, I was poking around on Instagram looking for Flagstaff food. 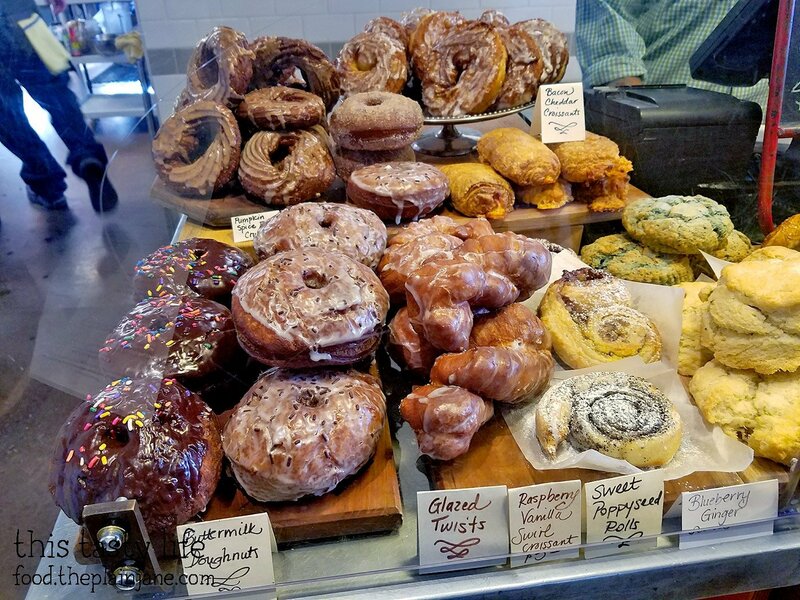 One photo that caught my eye was a photo of french crullers. 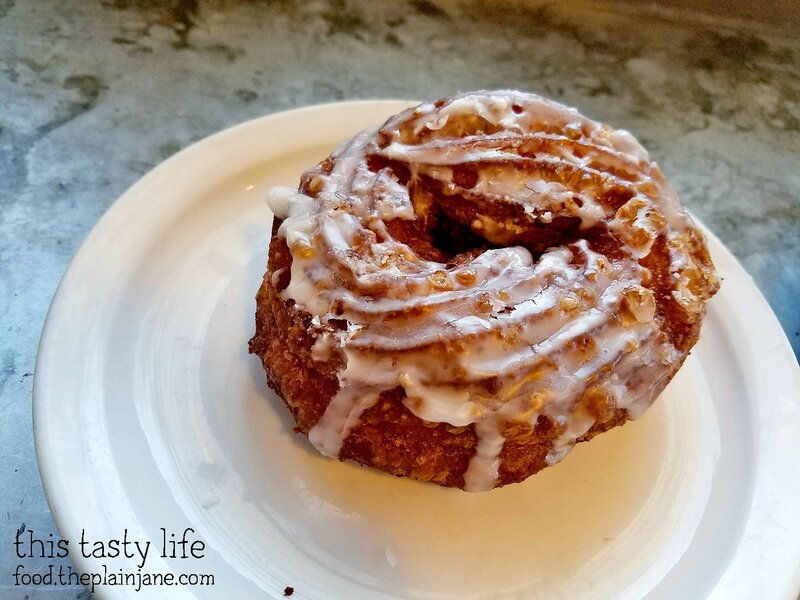 Crullers are my very favorite kind of donut and these french crullers were BEYOND good. Just… holy COW. These donuts were so light and airy on the inside – you can see the pockets in the photo above. There’s a nice vanilla glaze on top that gives it just enough sweetness. I loved the texture of this donut and the light crispiness on the edges. One of the best donuts EVER. 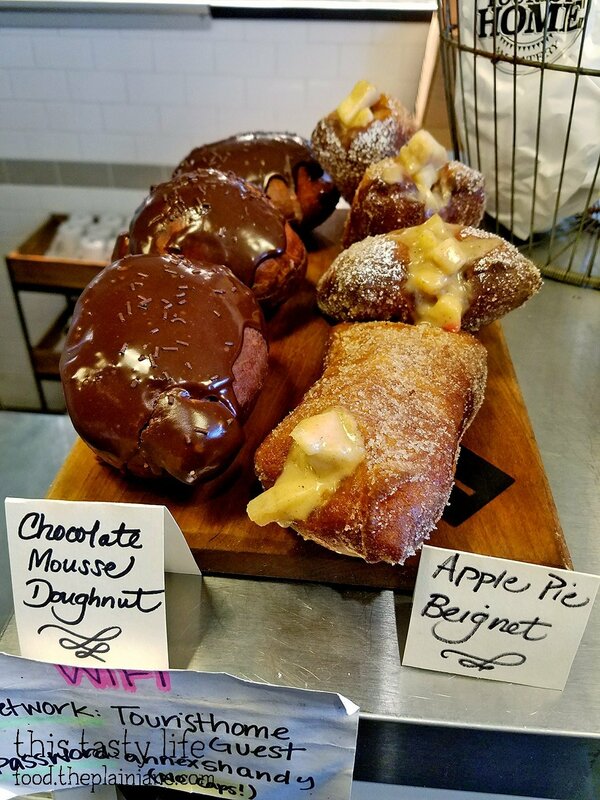 Seriously, this is why we came back – because I needed one more of these donuts before we left! T decided to get the BLT Sandwich [$8]. He got this TWICE as well. Ha. The first time he got it with potato chips and the second time he got it with fries (a $2 upcharge). The fries were much better. There’s an amazing aioli that they put on the BLT which takes it to the next level. Quite tasty! Since I bought a few baked goods, I figured I’d better stick with one of the kid’s meals. I knew the baked goods would fill me up so I didn’t want to have a huge breakfast in my belly. I ended up getting the Kid’s Classic [$5] which came with one egg, your choice of meat, toast, and jam. The perfect amount of food. Jake wasn’t feeling very breakfast-y so he got a Kid’s Chicken and Tots [$5] which comes with grilled chicken breast and tater tots. 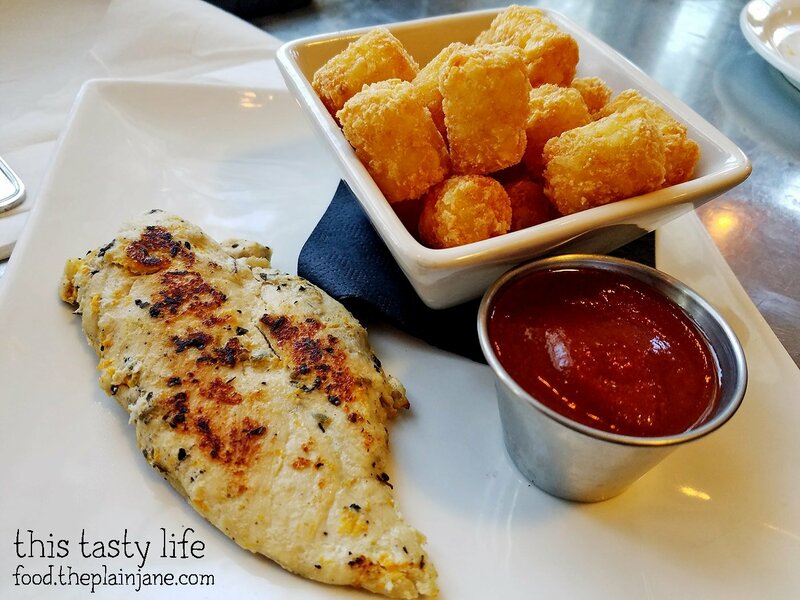 I thought the chicken breast was too dry but the tater tots were quite good. They make their own in house ketchup which tasted more like BBQ sauce to me. Jake wanted this donut, which I think is a Raspberry Beignet. They were labeled as beignets but these were really more of a heavy, bready donut than the lighter beignets covered in powdered sugar. 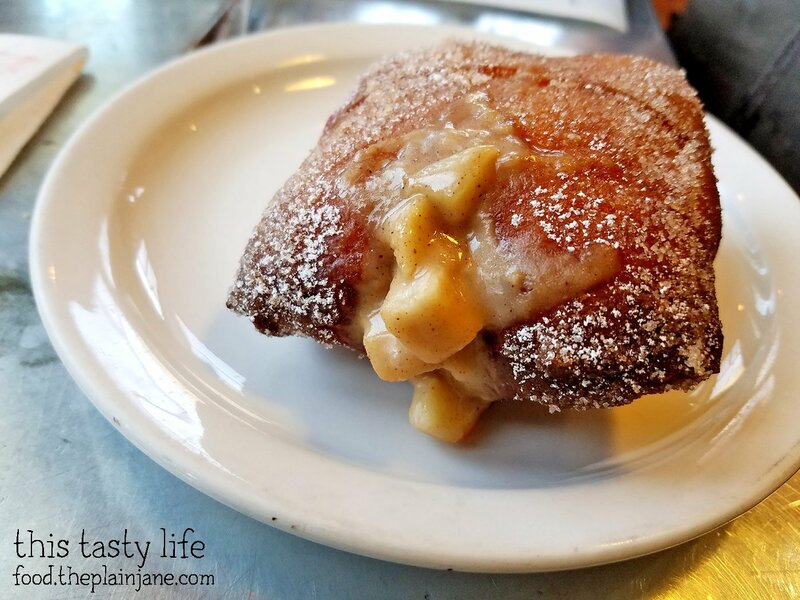 T went back to the counter and ordered one more donut for himself, this Apple Pie Beignet. Again – it was a very heavy donut. Quite chewy with a thick shell. The apple pie filling was quite nice inside but I felt like I was eating bread more than I was eating a donut. On the second visit I decided to take a few treats to go. 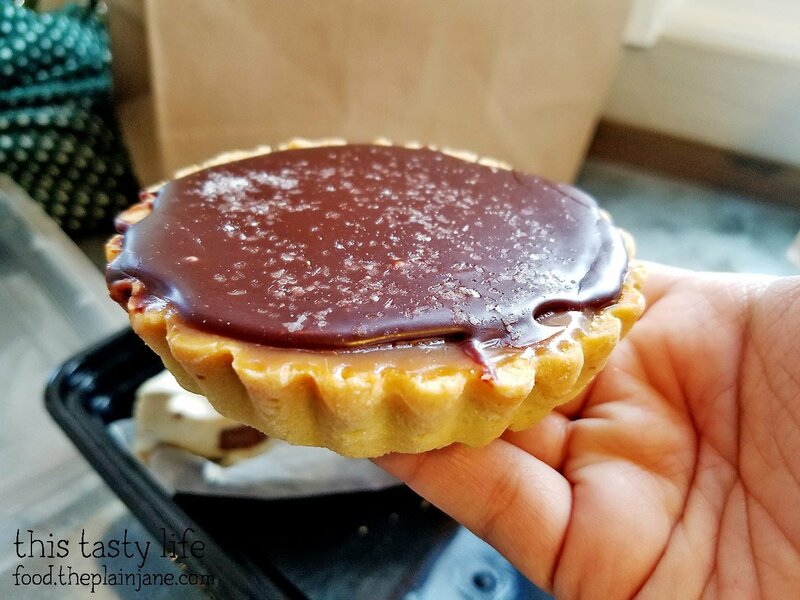 I enjoyed this Salted Caramel Tart [$3.50] later in the day (I stored it in our cooler). The chocolate top is dark chocolate so there was a slight bitterness along with the salty caramel. I wish this was milk chocolate instead since I’m not a big fan of dark chocolate, but I still enjoyed the tart. The buttery crust was a nice addition to the whole dessert. 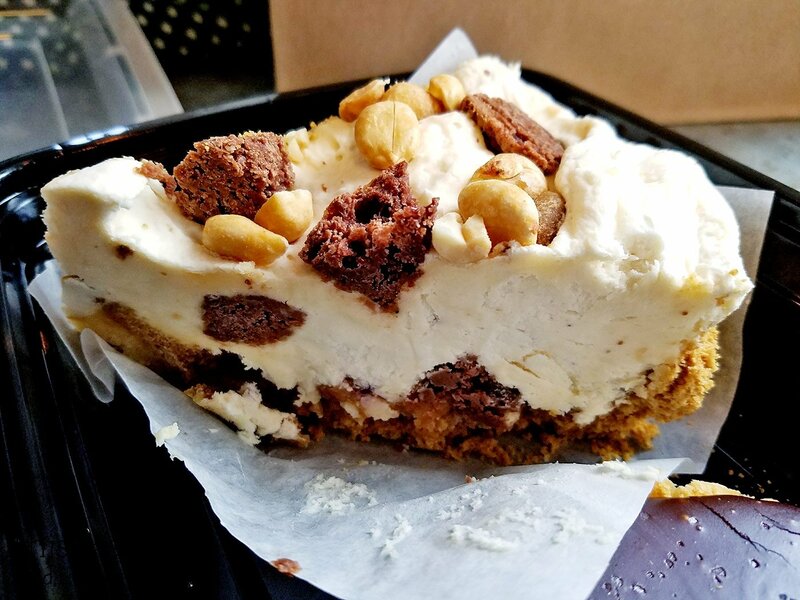 We also got a slice of Brownie Peanut Butter Pie to enjoy. I wanted to love this one, too, but alas… I did not. The brownie pieces within the pie were weirdly dry. I was expecting little fudgy bits within a creamy peanut butter pie but instead the brownie bits were pockets of disappointment. The peanut butter pie itself was fine, but I like my own version better which has more peanut butter flavor. While we were still at the restaurant on that second visit, T got a slice of Eggnog Cheesecake [$5] and gave me a couple of bites to try. 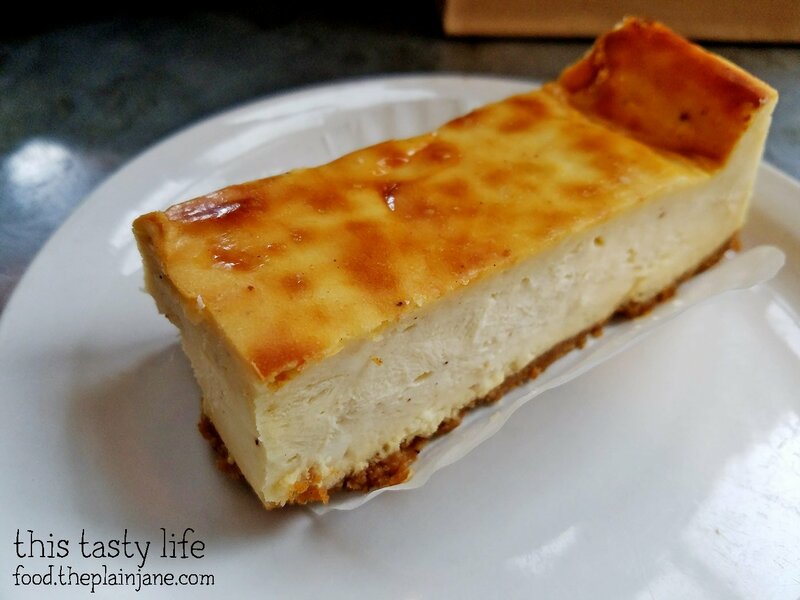 I was surprised that I liked it since eggnog is not high on my list of favorite things; but it was a subtle eggnog flavor that paired well with the very creamy cheesecake. A solid holiday choice. 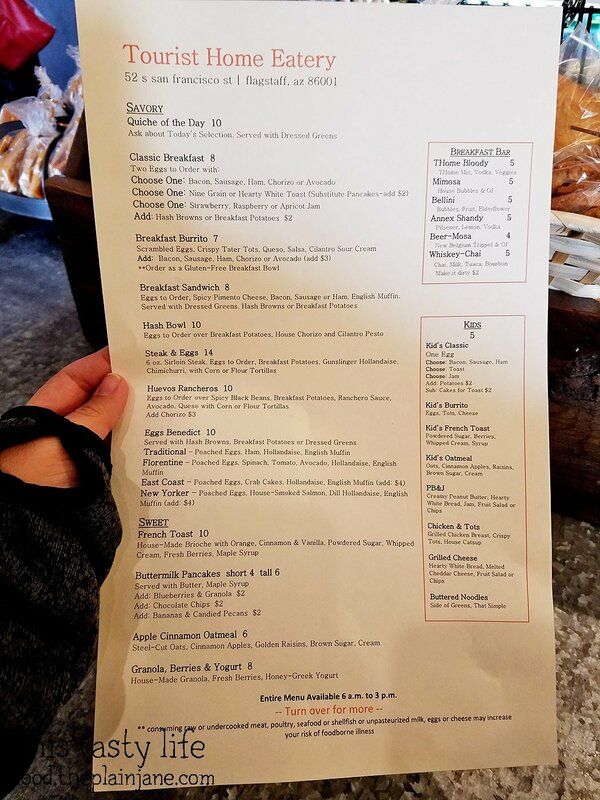 I got less baked goods to eat at the restaurant that second time around so I decided to splurge and get a Classic Eggs Benedict [$10]. 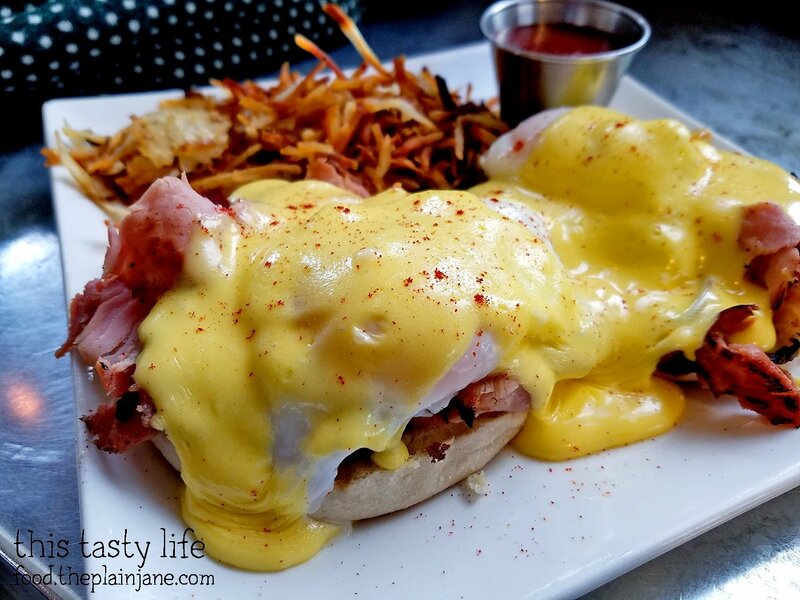 The hollandaise sauce they make here is on point! It was creamy and delicious and tasted wonderful with the poached egg and ham. 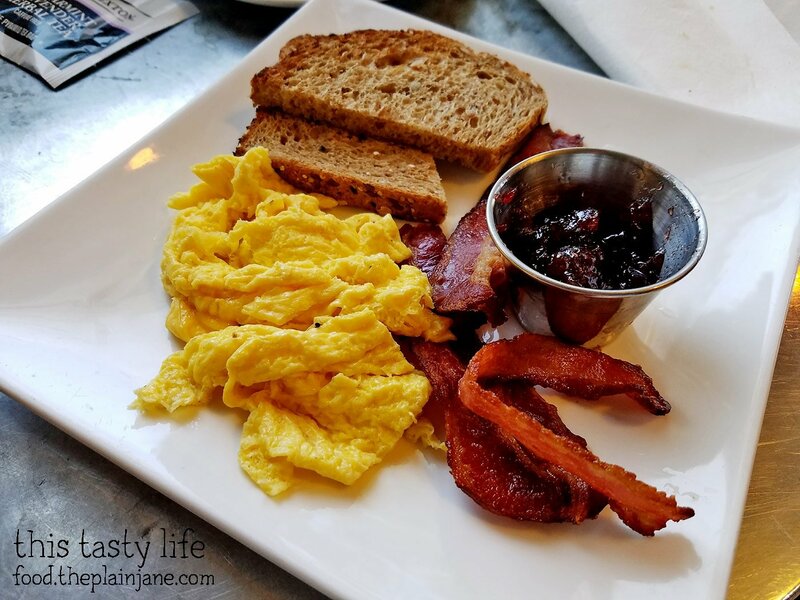 It looked like they used ham that was carved off a bone-in ham as well – none of that prepackaged crap they try to pass off as ham in the grocery store. I actually got full and only ate half and gave the rest to Jake to supplement his meal. Jake decided to go for the Kid’s Oatmeal [$5]. I bet he knew I wouldn’t finish my eggs benedict! They use steel cut oats for their oatmeal (aka the good kind!) and put in fruit and (evil) raisins. 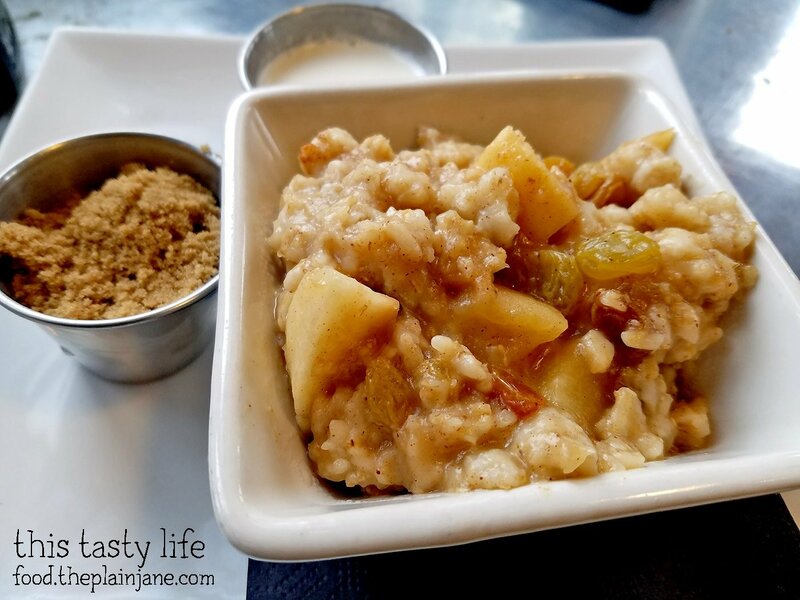 The brown sugar and milk are on the side so you can customize your oatmeal’s sweetness. T got a BLT again. They actually accidentally charged him twice and gave him two BLT’s. When they realized their mistake, they offered to comp the second BLT. T kept trying to refuse but the manager would not have it – she insisted on crediting him for the second BLT. She even processed the whole thing and just needed his card to make it go through – and that’s when he finally gave his card over to get the money back. Good customer service! 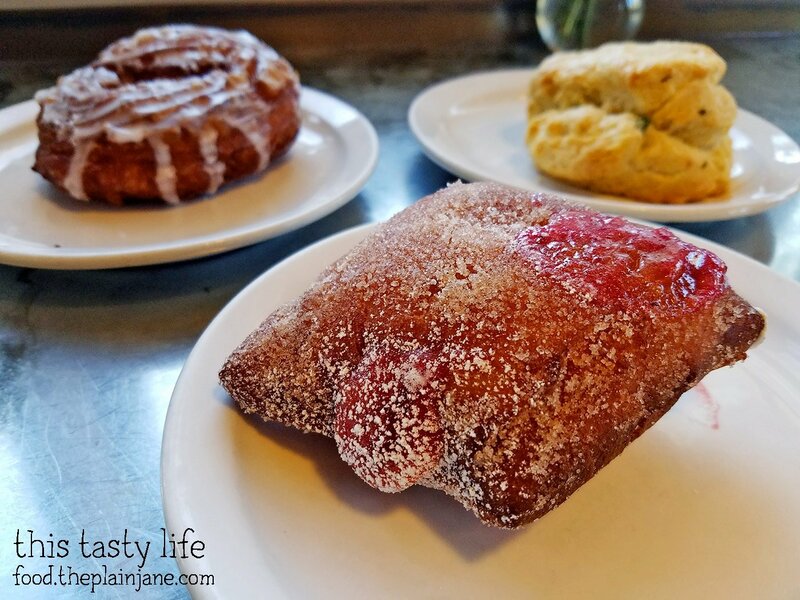 We learned from one of the gals working there that when you buy 3 baked goods, you get a discount. 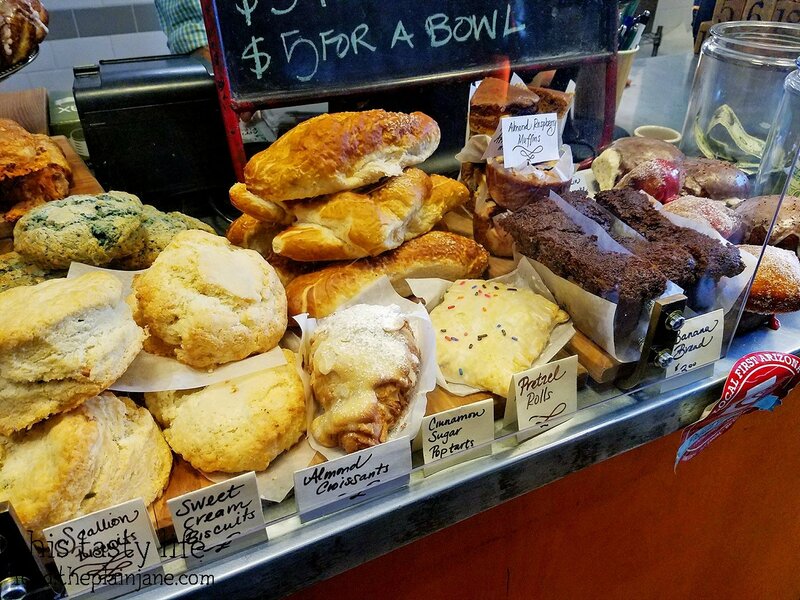 The discount applies to for all of the baked goods that are under $3. I actually don’t know how much the donuts were since there weren’t prices listed and I never got an itemized recipe. But we decided to splurge and each get a cruller to go. I ate my cruller in the afternoon when we were in Phoenix. It didn’t tasted quite as good as the fresh donut I had the day before – but it was still really excellent. 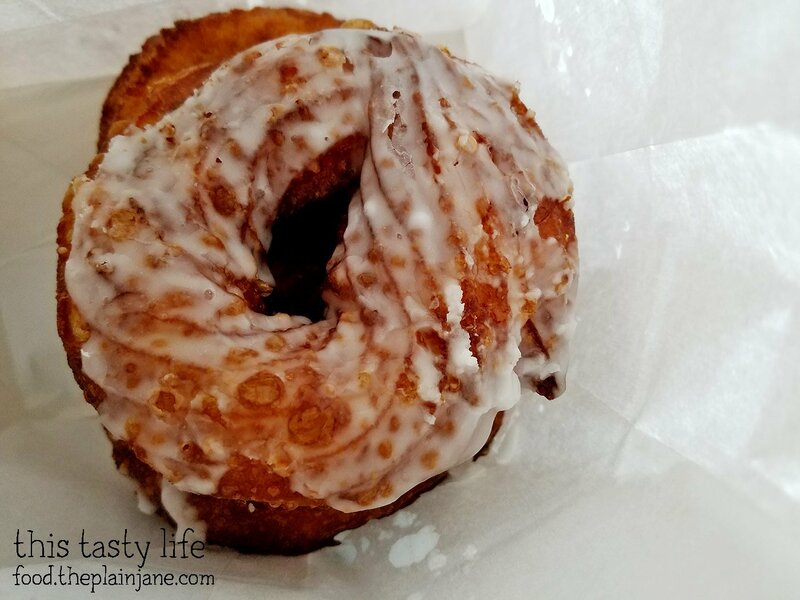 Crullers tend to not keep very well but even this partially old donut was one of the best I’ve had. 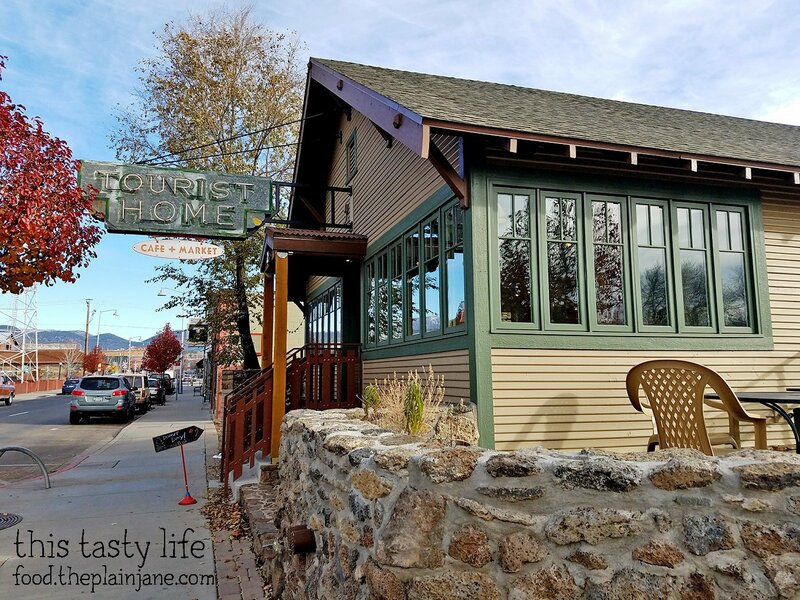 If you find yourself in Flagstaff, definitely stop in for a cruller or other delicious baked good from Tourist Home! 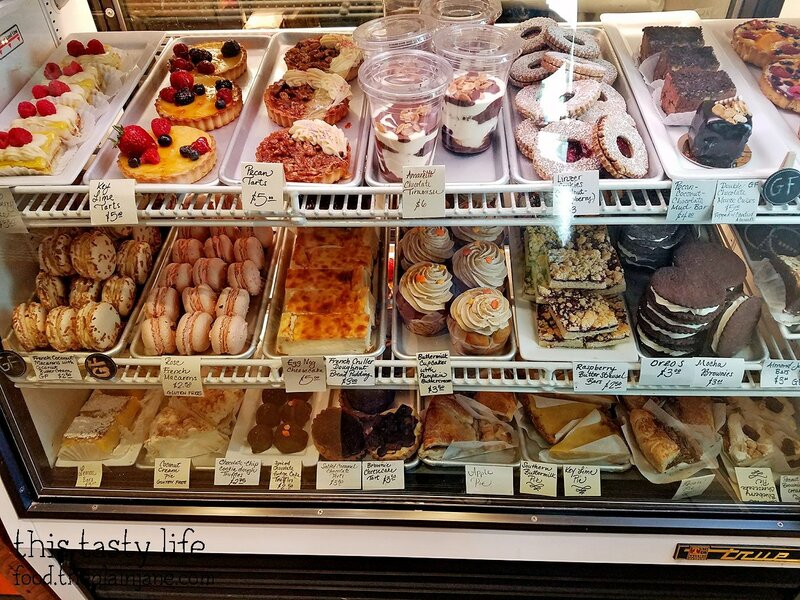 Omg, I would go crazy here trying to pick something and secretly wanting it all, haha.I would totally get that salted caramel chocolate tart (I do like dark chocolate over mill) too! Hi CC – Gosh I had that feeling – there were so many things I wanted to try! I’m glad we came twice just so I could try a bit more. There were too many good things, I wished for a sampler platter, haha.